I had an assistant hold the knuckle for me down on the concrete. The thing is that when you use Generic Tools to do a job you have to work with more care and have to make a decision if you want to take a chance on the tool or not. If you see that the Generic Press is not pressing the Ball Joint in straight you have to stop before you cause damage. That is an Autozone rental press. Not the best fitting equipment. But sufficient at doing the job after removing the ball joint boot. However, I will not recommend this press for anybody who has not used a press before and not have the experience of what they should be doing because you CAN easily deform the joint with this. I pressed mine in and out by hand using the rental tool from Advanced auto or autozone cant remember. The old ones had been WELDED in. The ball joint press tool that I have seen is around $350. The yellow arrow is not neccessary (for me anyway ). It is obvious with the position of the hammer/socket/steering knuckle that the ball joint can only come out in one direction. PS. The assistant holding the socket is very brave (or very foolish) depending how you look at it. If you try using a torch be careful not to use too much heat because it could weaken the steel around the ball joint. that's what my indie told me. 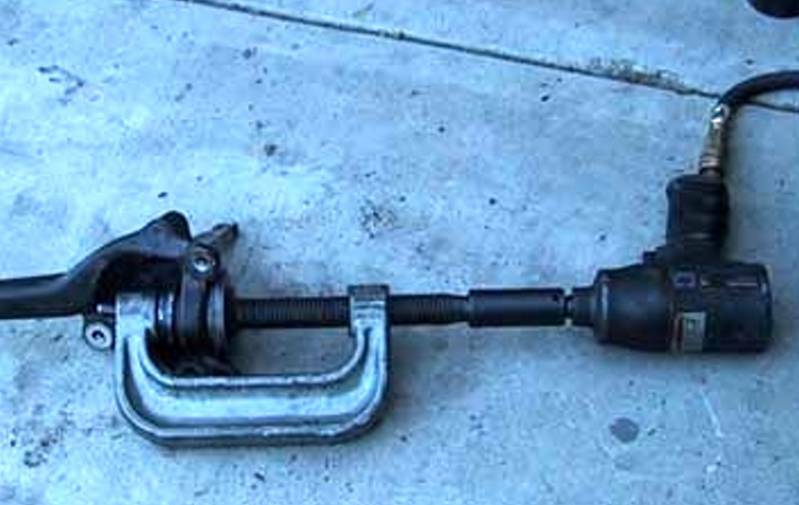 The best way to replace a Benz ball joint is with a checkbook. Good luck. It's not that bad! The initial hit was where the assistant was helpful and was able to be positioned far enough away where the hammer could not hit him. After you get the joint going down a bit, the socket now had a place so it will not slip off. Then you can use one hand to hold the socket and knuckle while hammering down. But I can see if being a problem if the joint was rusted in or perhaps welded. You however base your comments on speculation since you yourself have never used the Autozone press. And you base your comments on the one or two individuals who weren't successful in using it. These same people probably would have messed it up with the proper tool anyway. I have read a lot of your posts and your a great asset to this site but your not always right. 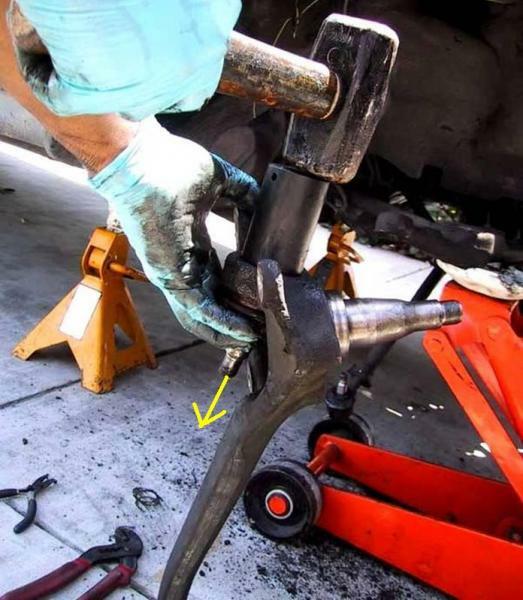 The ball joint in your pic must not have rusted in place and didn't require a lot of force. That's probably why it came out without clamping the knuckle in a vise and just resting it on the floor. I watched a shop do mine. They had the knuckle in a big vise on a metal bench (heavy and sturdy). With goggles and leather gloves on, one guy held a cylindrical brass hammer as a punch resting on the ball joint (which puts his hand safely 12" away), the other guy with a 3 ft long handle sledge hammer swung it like splitting wood. Took 3 shots and it came out. That would have been dangerous if not properly set up. I agree. The autozone press worked great for me with 10K miles on my ball joints with no issues. The ball joints holds the weight of the car? Yeah, I wanted to bring the knuckle to any indy to do removal and and installation, but just about every shop I asked said they'd charge me an hour (80-90) and the one shop that wouldn't charge me the whole seemed so unsure about the process that I don't really feel comfortable going to him (potentially wrong tools, indeterminate charge). I see why you chose not to go that route. I was lucky because there are a number of MB only shops around that had the tool. You might look in the tool rental section on this site or Performance Products also has the tool for rent. I remember watching the guys at the place that I took the parts and the put the press in a vice and then 2 guys pulled on the LONG breaker bar they used to turn the press screw. Damn, I can see why people think this is the single hardest job to do on the W123. Anyway, I took my sledge (long handle, maybe 10 lbs? ), and a 1/2" diameter pipe and started hitting away. No go, torched where the joint meets the knuckle, tried again, no go. I also drilled a .5 cm hole in the bottom, more out of curiosity than anything else. I think I'm going to take paul up on his offer. The ball joints on my car came out with a few whacks of a 3 lb sledge and big solid stainless steel scrap rod piece I found in the shop. I used a piece of wood on the concrete floor for knuckle.